A powerful solar eruption is expected to blast a stream of charged particles past Earth on Tuesday, as the strongest radiation storm since 2005 rages on the sun. NASA's Solar Dynamics Observatory caught an extreme ultraviolet flash from a huge eruption on the sun overnight (10:59 p.m. ET Sunday, or 0359 GMT Monday), according to SpaceWeather.com. The solar flare spewed from sunspot 1402, a region of the sun that has become increasingly active lately. Several NASA satellites, including the Solar Dynamics Observatory, the Solar Heliospheric Observatory and the STEREO spacecraft, observed the massive sun storm. 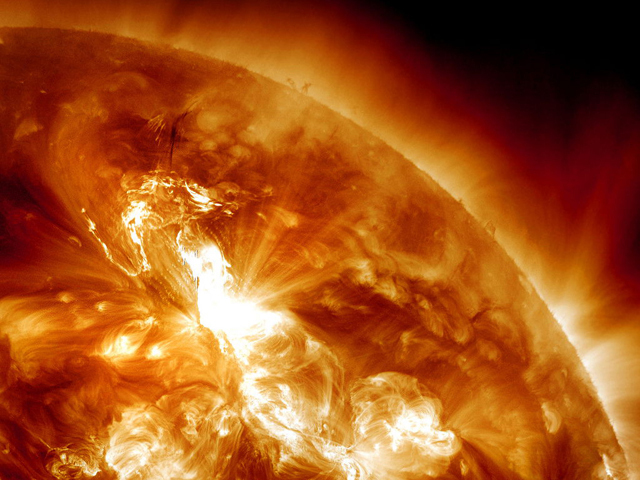 NOAA's forecasters say this is the strongest solar radiation storm since May 2005. As a precaution, polar flights on Earth are expected to be rerouted, the agency's deputy administrator, Kathy Sullivan, said Monday at the 92nd annual American Meteorological Society meeting in New Orleans. Scientists call these electromagnetic bursts "coronal mass ejections," and they are closely studied because they can produce potentially harmful geomagnetic storms when electrically charged particles from the sun interact with Earth's magnetic field. "There is little doubt that the cloud is heading in the general direction of Earth," SpaceWeather.com said in an alert. "A preliminary inspection of SOHO/STEREO imagery suggests that the CME will deliver a strong glancing blow to Earth's magnetic field on Jan. 24-25 as it sails mostly north of our planet." Sunday's solar flare was rated an M9-class eruption, which placed it just on the verge of being an X-class flare, the most powerful type of solar storm. M-class sun storms are powerful but midrange, while C-class flares are weaker. Last week, a separate sunspot group unleashed several M-class flares. SDO scientists said these types of flares are occurring almost daily as the sun's rotation slowly turns the region toward Earth.